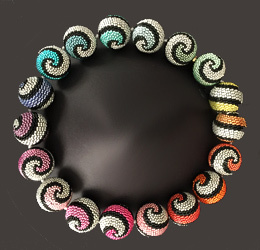 Barbara Packer was initially an internationally known quiltmaker, when she segued from stitching hundreds of fabric pieces two-dimensionally to weaving thousands of tiny glass beads onto globes, creating her one-of-a-kind “Bijoux Garne de Pearles”. Incorporating glass beads coated with precious metals produces eye-catching and elegant jewel-like qualities with her color sense and dynamic design. 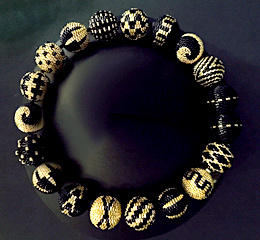 Collectors and beadlovers alike are enthusiastic about her work. 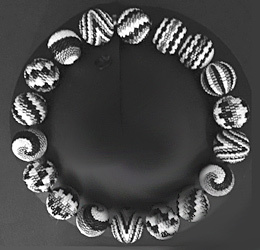 Packer has accomplished her goal of using an ancient and common material, i. e. glass made from sand, to create an original expression that makes her unique and distinctive beaded jewelry wearable for numerous occasions.